Installing or replacing base molding is a very easy job. The most common base molding is composed of three pieces. 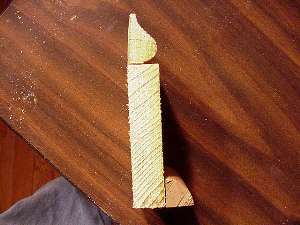 A 1x4 nailed to the wall, a piece of base cap molding nailed to the 1x4 and a piece of shoe molding or quarter round nailed to the 1x4. Older homes may have a 1x6 or 1x8 nailed to the wall. The 1x4 is pretty standard nowadays. The other type of base molding is what looks to be a 1x6 that has been milled to resemble two pieces of the three piece molding. This molding is easier to install but lacks the distinct shadow lines of the three piece molding. You should use the same type of molding, if possible, as exists elsewhere in your home. This will make the look of your molding as consistent as possible. Ensure adequate ventilation when staining and painting.